A personal disaster in New York City sends promising clothing designer Gwyn Halliday fleeing home to the sleepy Gulfcoast resort and retirement community of Golden Beach, Florida, where she turns her talents to designing costumes. Five years later, her shop, DreamWear - Costumes and Creations, is a success, providing rental costumes to native Floridians, local retirees, and to the snowbirds and tourists who flock to the area each winter. Gwyn has come to terms with being an exotic blossom in a sea of seniors when one of her customers is killed (wearing DreamWear's best Santa suit), and she suspects the so-called "boating accident" was murder. In rapid succession Gwyn meets the new Chief of Police (from landlocked Nebraska), runs into a former crush (now suffering from PTSD), and begins to suspect an elderly senior is being targeted by a series of scams (one possibly lethal). And then her brother becomes a suspect. Gwyn is well aware she should stick to costumes, but what's a girl to do when things get personal? A Note from Blair: Golden Beach is an actual Florida Gulfcoast town, whose residents would prefer to keep its real name secret. Only a few of my Golden Beach books have cross-over characters, but all share the same idyllic setting. (Or at least it was before I made bad things happen there.) 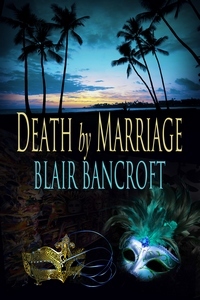 Besides Death by Marriage, the Golden Beach books are: Shadowed Paradise, Paradise Burning, and Orange Blossoms & Mayhem.